In modern life, there are three guarantees: death, taxes, and check engine lights. While no one relishes the prospect of any, Truckee’s Quality Automotive and Smog can certainly alleviate the hardships brought upon by cars. We’ve always had such great experiences when we visit Quality Auto (as do the 118 pages of five-star reviews on their website!) and we were curious to find out more about the owners, Bill and Sheila Greeno, and what makes their Truckee business so special. Bill and Sheila Greeno, proud owners of Quality Automotive and Smog. So, what makes Quality Automotive and Smog an outstanding local business? Front desk staff Gary and Maggie will always greet you with a smile. First, the staff is outstanding. When we asked Bill what his favorite part of running this business is, he said, “my employees”. Not only do the technicians possess expert diagnostic skills, Bill explains that they also “make a vital connection with customers.” Customers know the exact issues with their cars and are provided with comprehensive information to ensure they can make "smart" decisions about their vehicle. “We provide a complete picture of the condition of their vehicle and help prioritize repairs and maintenance,” says Bill. Quality Auto and Smog has such a great staff because of their hiring practices, training, and team building. Second, Bill and Sheila are constantly showing their customers how much they love them. “We enjoy talking with them and working on their vehicles. Many of our customers are our friends and neighbors,” says Sheila. They offer programs to customers such as complimentary lift tickets, courtesy e-bikes, and complimentary car washes. Recently, they have launched a new program called "ServicePlus 5% Dividend", which allows customers to receive a 5% credit based on their invoice that can be used on any future service. And customers can benefit from extended warranties by joining the Red Check Club. Courtesy bikes make getting around easy while your car is in the shop. Sheila: I don't have a favorite. I ski, mountain bike, hike, golf, paddle board and enjoy whitewater river rafting. 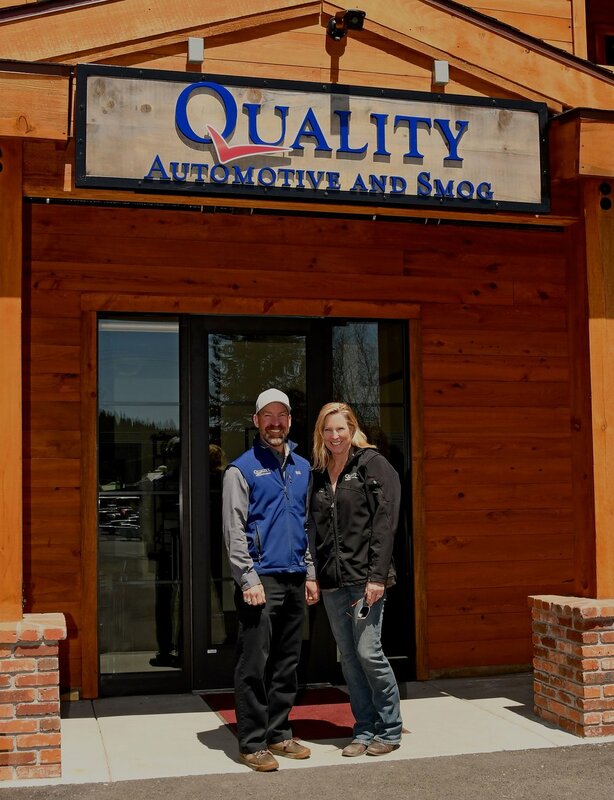 Find Bill and Sheila at Quality Auto and Smog or online on Facebook or their website.